About 80,000 lower-extremity amputations (LEAs) are performed each year on patients with diabetes in the United States. Statistical analyses have shown that the annual incidence of LEA in older patients with diabetes was 5.0 per 1,000 in 2006-2007, but decreased to 4.0 per 1,000 in 2008. 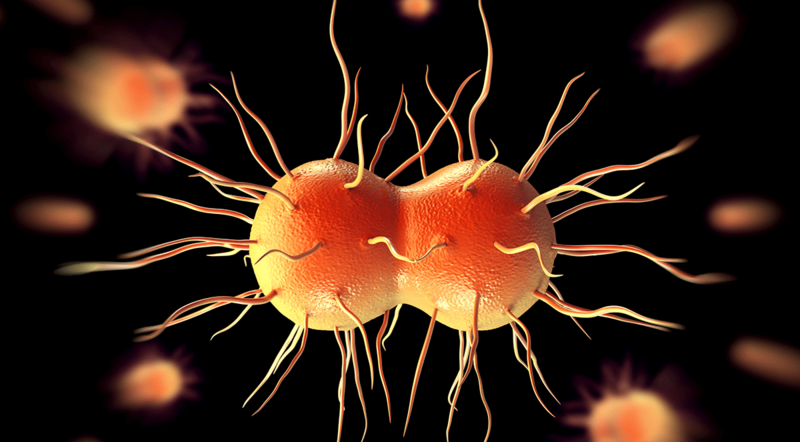 “While the downward trend is encouraging, it’s important to also analyze variations in the rates of LEAs throughout the country,” says David J. Margolis, MD, PhD. 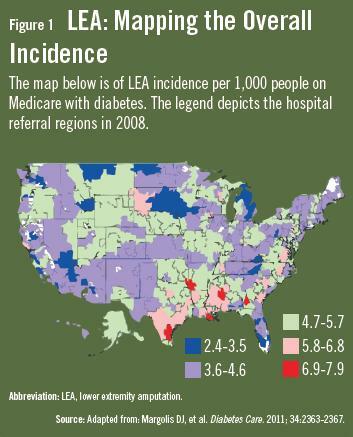 Previous studies have shown that there appears to be geographic variation in the incidence of LEAs among Medicare beneficiaries with diabetes. Furthermore, about $52,000 is reimbursed annually for a Medicare beneficiary with diabetes and an LEA. “By learning more about geographic variation in LEA, we can then identify causes and develop targeted interventions for prevention,” Dr. Margolis says. In the November 2011 issue of Diabetes Care, Dr. Margolis and colleagues conducted a study to explore graphic variation of incident LEAs among Medicare beneficiaries with diabetes. The investigators performed a study of the full population of Medicare beneficiaries because it is, in essence, the largest healthcare insurance provider in the U.S. and the largest government-funded medical entitlement program. The geographic unit of analysis was hospital referral regions (HRRs). 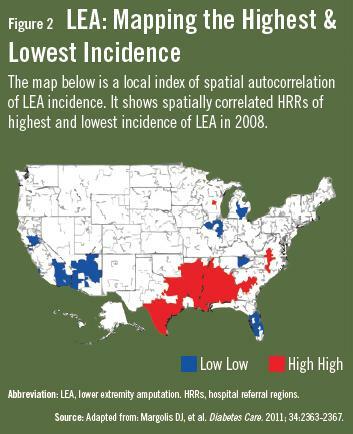 The study then evaluated the incidence of LEA by HRRs as a function of geographic location throughout the country. Other items analyzed in the study included sociodemographic factors, risk factors for LEA, diabetes severity, provider access, and cost of care. Mortality rate associated with having a foot ulcer. Dr. Margolis and colleagues were able to account for the prevalence of diabetes in a given area, the number of people diagnosed with diabetic foot ulcers, and an area’s socioeconomic status. However, these factors accounted for some of the geographic variation, but not all of it. It is also important to note that the relatively high rates of LEA in certain regions do not necessarily mean that the rates are too high, Dr. Margolis says. Margolis DJ, Hoffstad O, Nafash J, et al. Location, location, location: geographic clustering of lower-extremity amputation among Medicare beneficiaries with diabetes. Diabetes Care. 2011 Sep 20 [Epub ahead of print]. Available at: http://care.diabetesjournals.org/content/early/2011/09/19/dc11-0807.abstract. Margolis D, Malay DS, Hoffstad OJ, et al. Economic burden of diabetic foot ulcers and amputation: diabetic foot ulcers. Data Points #3. Rockville, MD, Agency for Healthcare Research and Quality, U.S. Dept. of Health and Human Services, January 2011 (AHRQ Publ. No. 10-EHC009-2-EF). Brem H, Sheehan P, Boulton AJ. Protocol for treatment of diabetic foot ulcers. Am J Surg. 2004;187:1S-10S. Boulton AJ, Vileikyte L, Ragnarson-Tennvall G, Apelqvist J. The global burden of diabetic foot disease. Lancet. 2005;366:1719-1724. Margolis DJ, Hofstad O, Feldman HI. Association between renal failure and foot ulcer or lower-extremity amputation in patients with diabetes. Diabetes Care. 2008;31:1331-1336. Wrobel JS, Mayfield JA, Reiber GE. Geographic variation of lower-extremity major amputation in individuals with and without diabetes in the Medicare population. Diabetes Care. 2001;24:860-864. Margolis D, Malay DS, Hoffstad OJ, et al. Prevalence of diabetes, diabetic foot ulcer, and lower extremity amputation among Medicare beneficiaries, 2006 to 2008. Data Points #1. Rockville, MD, Agency for Healthcare Research and Quality, U.S. Dept. of Health and Human Services, February 2011 (AHRQ Publ. No. 10-EHC009-EF). Boulton AJ. The diabetic foot: grand overview, epidemiology and pathogenesis. Diabetes Metab Res Rev. 2008;24(Suppl 1):S3-S6. David J. Margolis, MD, PhD, has indicated to Physician’s Weekly that he has or has had no financial interests to report.